Finishing second can’t be the limit of Rangers’ ambitions, said chairman Dave King in the midst of otherwise sober reflections at the club’s agm on Friday. For 93 minutes of a first league trip to Firhill in 13 years, merely claiming that status in the Premiership seemed destined to stretch the Ibrox men beyond their limits. In the closing seconds of a pulsating second period, though, substitute Joe Dodoo produced a terrific clincher to double his day’s tally of sweet strikes and move his team above an Aberdeen side not in league action this weekend because of this afternoon’s League Cup final. The 21-year-old steered a clinical effort into the far corner from a Kenny Miller knock down to send the visiting supporters into a frenzy, having levelled up the scores in the 82nd minute with an exquisite curling volley from the opposite flank after being set-up by his veteran team-mate. It was a denouement cruel on Partick Thistle after Kris Doolan had given them an 76th minute lead, their talisman hooking a shot past James Tavernier from eight yards after he initially headed against the same player. Against that, Rangers’ ability to extricate themselves from that position, and dig out an added-time winner for a second successive week, is a testament to their character. Mark Warburton may be in charge of a flawed team but he can comfort himself that their flakiness is being masked by an ability to produce the right outcomes. They have five victories and two draws from their past seven league games, the sort of form that does make a team competitive in any set-up. What will be tested in the next fortnight – they face Hearts at Tynecastle on Wednesday, then entertain Aberdeen before hosting Hearts – will be the capacity of Warburton’s side to be competitive against the teams jousting for the leading places in the Premiership. The Ibrox manager refused to see these three games as a set. “There was no point in us looking at Hearts before we played Thistle, no point looking at Aberdeen before Wednesday night,” he said. Pushing a Celtic that remain eight points above them despite having played two games fewer simply isn’t on the agenda. 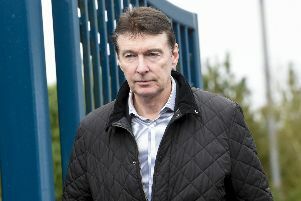 King admitted as much when he said that “artificial euphoria” caused by the Scottish Cup semi-final over their rivals had overly raised hopes, though the South African based businessman also said he “did expect” his team to be “more competitive”. The problem for Rangers this season is that absolutely any team can look more impressive than them for long spells. Thistle, coming off the back of a grim 2-0 loss at Motherwell, did so for the majority of the opening period. They were punchier and had great poise, though aside from Wes Foderingham saving from Doolan on the turn, and Chris Erskine having an effort blocked close in, didn’t threaten any more than their visitors. Miller had a downward header pushed away by the home keeper and Jason Holt almost connected from point-blank range. The encounter really opened up after the restart. Within a minute, referee Nick Walsh inexplicably waved play on after Abdul Osman stumbled into Harry Forrester and decked the attacker as he burrowed into the box. Chances then began to be fashioned at regular intervals with Foderingham thwarting both Erskine and Chrissy Elliott before Chris Stuckmann stood tall to block from Forrester after the forward found himself one-on-one with the home keeper.